With the Cataclysm over and the threat of 死亡之翼 subsided, a summit of the Horde's leaders was held in Orgrimmar. 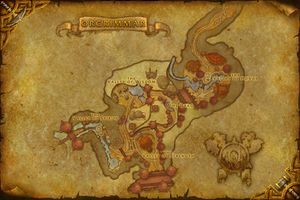 Here, Garrosh informed his allies about his desire to forcibly expel the Alliance from Kalimdor, and claim the continent for the good of the 部落. Garrosh intended to scour Theramore from the continent, and stunt the Alliance's military presence. With that done, he then aims to take the night elves' land. Orgrimmar is effectively put under martial law, as Garrosh continues to opress the non-orc members of the city. All non-orc districts of the city lose most of their supplies and are heavily guarded by the Kor'kron, under suspicion that they might be working with the rebels. 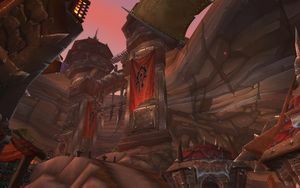 The supply lines to Orgrimmar from the Northern Barrens are cut off and 沃金 has taken the strategic settlement of Razor Hill from Garrosh's loyalists, essentially putting the city under threat of siege from the rebellion to the south as well as the Alliance armada amassing to the east. During the 决战奥格瑞玛, the city is put under siege by the forces of the Horde rebels and the Alliance. 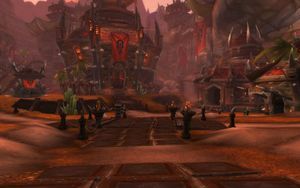 Kor'kron barricades block access to most of the city's districts. 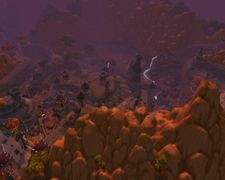 Vol'jin's revolutionary forces have entrenched themselves along the main road, launching a frontal assault on the city's gates to break into the Valley of Strength. Alliance frigates storm the Bladefist Bay and landing parties attempt to capture the docks around Orgrimmar. Invading forces discover a massive underground compound constructed by Garrosh's forces for his own purposes. 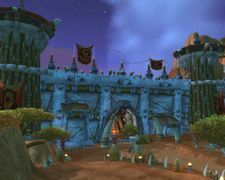 Skirmishes at the gates occurred before a full-scale battle erupted between the forces led by Vol'jin and the defenders still loyal to Garrosh. 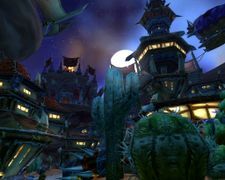 Despite Vol'jin's attempts to ram the gate and attack the walls with siege engines, the walls could not be breached. The arrival of a combined rebel and Alliance armada under the command of 洛瑟玛·塞隆, 瓦里安·乌瑞恩, 吉安娜·普罗德摩尔, and Sylvanas Windrunner disabled Orgrimmar's naval defenses. Eventually the Kor'kron were pushed back into the gates and the arrival of Night Elf reinforcements under 泰兰德·语风. Night Elf glaive throwers brought the gate down, and the allied forces charged into Orgrimmar. The Valley of Strength was quickly liberated, and the death of General Nazgrim brought the upper city under Alliance/rebel control. The Underhold eventually fell when adventurers defeated and imprisoned the Warchief Garrosh. 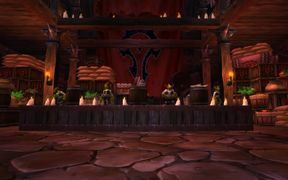 Vol'jin was quickly nominated and initiated as the new Warchief by Thrall and the other Horde leaders. Alliance forces left the city, and the rebels began rebuilding the damage that was done during the siege. 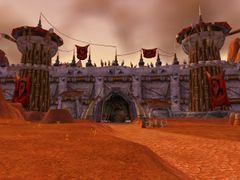 Following the deposition of Garrosh, rebel forces began rebuilding the damage done to Orgrimmar during the siege and members of the Horde of all races began moving back to the city, resulting in a major population increase. 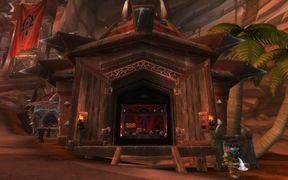 [请求来源] The newly elected Warchief 沃金 has also taken up residence in Orgrimmar, ruling the Horde from Grommash Hold, while members of all races have formed a new city guard. The Underhold has largely been vacated[请求来源] and its arsenal destroyed, and the trade routes previously blockaded during the siege have been restored and the city has begun to prosper again. [请求来源] The Valley of Spirits and the Valley of Wisdom have also been liberated from Kor'kron control and have returned to normal. 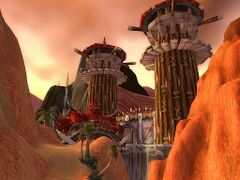 Orgrimmar is located in the far north of Durotar, at the foothills of the mountain range that separates Durotar from Azshara. Several valleys have been dug out from the mountain and provide a way of naturally dissecting the city into various zones, including the Valley of Spirits, Valley of Strength, Valley of Wisdom, and the Valley of Honor. Several specialty shops are found in the Drag, a dark pathway that leads from the Valley of Strength to the Valley of Honor. Those searching for potions or training in the darker arts of the rogue or warlock find a tunnel leading down to the Cleft of Shadow from the Drag. 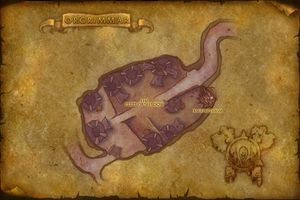 Orgrimmar is openly hospitable to all members of the 部落 and is an important center of commerce. Visitors may fly into the city by way of zeppelin or wyvern, or simply walk through the fortress’s main gates. 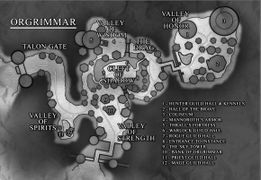 In 决战奥格瑞玛 there is also a massive underground compound named the Underhold, which is located deep within Ragefire Chasm, used by the Kor'kron Guard as their headquarters. Garrosh Hellscream has his own inner sanctum there. From his throne in the Valley of Strength, Warchief Garrosh used to rule with the continuing support of the blood knight Master Pyreanor, The warrior Eitrigg, and formerly the wise shaman Sauranok the Mystic. In this Garrosh and his advisors plan on how to deal with the Alliance, Scourge, and Burning Legion forces. 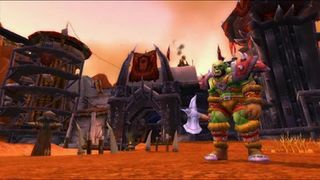 Though formerly warchief Thrall allowed Human traders and sailors to visit the city, Garrosh had declared all out war with the humans and other Alliance races. Garrosh, with the help of the goblins of the 锈水财阀 and the prominent Boss Mida, reshaped Orgrimmar into a city of war, bringing various machinery. The Quartermasters of the Darkspear Trolls, Orgrimmar, and 锈水财阀 reside near the Flight Master. 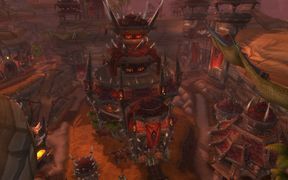 After Orgrimmar was rebuilt by Garrosh, 凯恩·血蹄 likened the city to Hellfire Citadel. 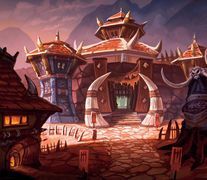 In the 决战奥格瑞玛, it is revealed that Garrosh had built a massive underground complex known as the Underhold in 怒焰裂谷, beneath Orgrimmar. Following the siege, it is unknown what happened to it. One of the classic game boards in Hearthstone: Heroes of Warcraft is themed around Orgrimmar. The presence of the Ragefire group of troggs in 怒焰裂谷 beneath Orgrimmar may indicate that there might be the remains of a titan vault similar to Uldaman underneath the city. Following the 决战奥格瑞玛, and the end of the 联盟-部落战争, it can be presumed that Orgrimmar's military focus has diminished. 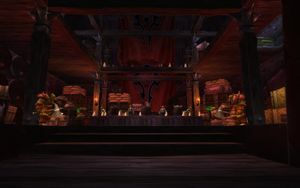 It is currently unknown what Vol'jins's stance is on allowing human traders into the city, thought It is presumed that he followed Thrall's example. 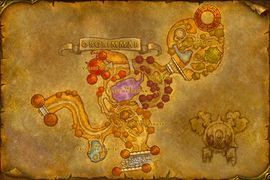 Detailed map of Pre-Cataclysm Orgrimmar. ↑ The Founding of Durotar: To Tame a Land, Warcraft III: The Frozen Throne. Blizzard Entertainment.